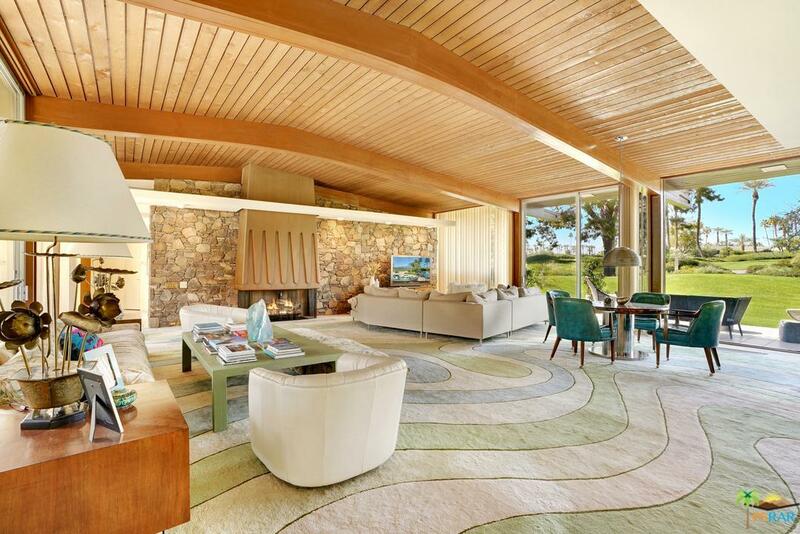 Mid Century Modern Gem in the Heart of Eldorado C.C. An Ira Johnson designed home full of amazing organic and streamlined wood beams stretching throughout home. Great room w/fireplace, massive stone wall and sunken bar features floor-to-ceiling glass bringing light and views of trees, fairways and the mountains beyond. Dining room, breakfast nook and spacious kitchen with a meat locker/pantry flow off the main living area. Maid's quarters has one bedroom and bath off of kitchen with separate entrance. The main house has 2 guest suites with views of golf course, pool and mountains. The master bedroom is spacious with walk-in closet and large bright bathroom. The private guest house has an open bedroom/living room with fireplace, kitchenette, walk-in closet and bathroom with views. The pool area has multiple seating areas perfect for your next get together or party. Many great clean lined architectural details inside and out. A must see for the Mid Century Enthusiast!